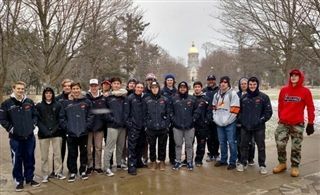 The Firebirds Hockey team took to the road for the prestigious Hoosier cup tournament at the University of Notre Dame. The Firebirds took on two state champion teams and the nation's number 1-ranked team and eventual tournament winner, New Trier Green, and put in a strong performance in all three contests. In spite of three losses, the players showed they can hang with the best and got great experience with a faster speed of play. The weekend was also filled with wonderful team experiences including campus and locker room tours at the University of Notre Dame. Come cheer them on at their last home game of the season on February 4 at 3:45 p.m., at Icetown Carlsbad.